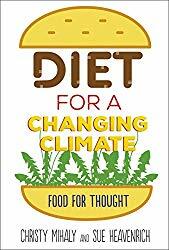 Have you seen Christy Mihaly and Sue Heavenrich’s wonderful new book, Diet for a Changing Planet: Food for Thought? We all know the food we eat can determine our health, but what about change the health of our planet? Mihaly and Heavenrich make a case that eating certain plants and animals — a few that are not normally on the menu — might do just that. The authors start by revealing some of the plants we think of as weeds were brought to North America from Europe on purpose as food and/or herbal remedies. Dandelions and purslane, for example, are thought to have been been imported and grown intentionally before they escaped from gardens and were labeled as weeds. Perhaps it is time to turn back the clock. What could be more local than eating plants that grow readily in almost any yard? To entice the reader to try them, the authors offer recipes, such as for dandelion flower pancakes. The next step is to consider eating some of the species that have become invasive, for example Asian carp or garlic mustard, which is a weed. They also suggest eating insects and other invertebrates as alternative protein sources. The authors have thought this through because they offer plenty of cautions. For example, people who are allergic to shellfish may also be allergic to insects. Although kudsu is edible, the plant is a three-leaved vine that closely resembles and grows in the same locales as poison ivy. The ability to identify these plants and animals accurately is critical. The book has a modern look sure to entice young people. The art director writes about decisions about the cover design on the Lerner blog might interest future artists. Inside a number of color stock photographs catch the eye. Diet for a Changing Planet is definitely “Food for Thought.” Given that some young people think meals arise spontaneously and have trouble telling a turnip from a red onion in the grocery store (true story), the idea of foraging for food outdoors and preparing it themselves may be a hard sell. Even so, reading this book may plant some seeds of ideas that will come to fruition later on. Curious about how the book came about? Check out Writing as a Team at GROG. Original review and some activity suggestions at Growing with Science. Categories: STEM Friday round-up | Tags: Diet for a Changing Climate | Permalink.